Western Australian Premier, Colin Barnett is once again feeling the heat from his now quashed drum line policy after it was recently revealed in The Guardian Australia that the "silent majority" which Barnett repeatedly stated supported the program actually was one key stakeholder: the Margaret River Board Riders Club. The response from Barnett regarding this revelation is another term he likes to repeat: that the driver behind the policy was his "responsibility to public safety." But with local government officers and officers within the Department of Fisheries raising major risk concerns about the drum line program in the consultation process, including a lack of clarity around the procedures, the request for signage at beaches (which have not been implemented) and spelling out in no uncertain terms that "killing will not help public safety" it would appear that the main driver for the Western Australian Drum Line Policy was something other than a responsibility to public safety. As such, No Shark Cull Inc. has thoroughly investigated the Margaret River Board Riders submission which Sea Shepherd Australia released, looking into what else the drivers may be. The submission is in a form of a letter addressed to Troy Buswell dated Dec. 6, 2013 which was when Mr Buswell was the WA Fisheries Minister and Member for Vasse (the electorate which covers Margaret River, Busselton and Yallingup). The letter is written by one individual on behalf of "representatives from Margaret River Board Riders Inc. and Yallingup Surfers Club Association Inc." The author is connected to Brett Merifield who, in the letter writer's view was "chased out of the water by a big White Shark at Shallows surf break just North of Yallingup beach" in 2012. This incident was covered by the Busselton-Dunsborough Mail in October 2012 in this article titled "Close call for surfers." It is stated that a meeting was held on Dec. 2, 2013 to discuss the issue of Great White Shark management. Surfer and father to Brett Merified, Kevin Merifield was known to organize meetings for local surfers to "come together and express their perspective" of the drum lines as per this article whereby he states "When there's the number of fatalities that there has been, the Government had no alternative." Kevin Merifield was also a very big developer in the Busselton region, with connections to Kerry Stokes and Jack Bendat who he bought and developed a number of regional shopping centers with. Property developments within the City of Busselton meant Merifield had to liaise with council members regularly, which at the time involved Councillor and Shire President, Troy Buswell. Mr. Merifield is well known to the Liberal Party, often discussed in Hansard by Western Australian Liberal members in regards to property developments in the South-West, including the very controversial Smiths Beach Project which attracted the likes of Brian Burke, Julian Grill and Noel Crighton-Browne, the latter writing editorials to the West Australian complaining about the organizers of the No Shark Cull rally. With Troy Buswell being the Fisheries Minister and the member for Vasse at the time that the drum line policy was announced, could it be that Kevin Merifield's views and prominence outweighed the views of more than 80 percent of the community, which had stated in 2013 that they did not want a drum line policy? It certainly seems that way. 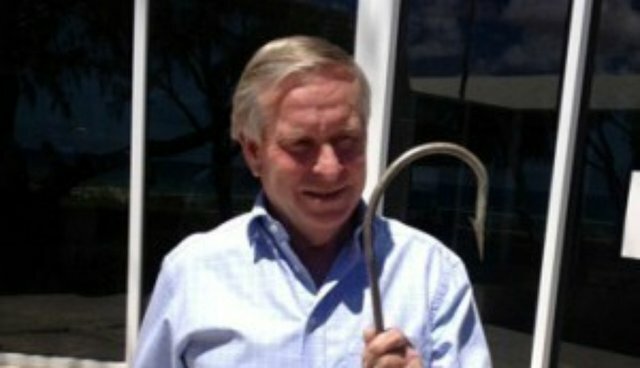 Top Photo: Premier Colin Barnett proudly holding the drum line hook prior to them being used in January 2014.